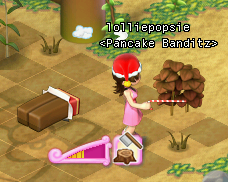 Today was the day of the Pancake Bandits Guild Event! It was so much fun, I had such a great time! First we all met in Paris, which I had spent so much work getting to the day before. Only Aframe and Neveltje were there ar first, but soon lots more people started arriving! But then one guildie had trouble getting to London, so we all decided to go back to London. I really couldn’t make it on my own, and everyone else had already rushed ahead! We played hide and seek, where one person would go and hide and we would all go off the map so we couldn’t see them hiding. And they hid in buildings of course! And then we had to go and find them, it was really fun! On the last round, Neveltje decided to hide in Floraploris instead of Paris! She chose a very difficult hiding place, and we all had to look very hard! But then I found her in Pinkuru’s House! Yay! Aframe gave me some very lovely items as a prize. Hide and seek was over, but the event wasn’t quite finished yet! We still had the Pancake Giveaway left to go! Some people had to go at that point, but the rest of us met in Floraploris. Aframe kindly explained what we were going to do: Give away free food to as many people as possible! It didn’t have to be pancakes, it could be anything. That was good as I had lots of extra food with me! We then went to the Harbour where we started the giveaway! I hope we made lots of people happy! 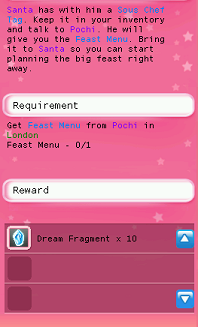 I had to go a little while before the event was officialy over, but I had succeeded in giving away nearly all my food! I also recieved a yummy pancake! I really enjoyed that event and hope we can do another one soon! 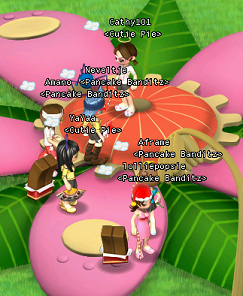 The Pancake Banditz Event is being held tomorrow, at 3:00pm server time in Paris! As I have never been to Paris before I decided to start making my way over there, if I don’t make it I will have to miss out! I logged on to find myself in London, a good start. No time to chat, I have to get to Paris as soon as possible! I started my journey along North Secret Peak. What a scary place! The monsters were tough, but I waited for the right moment so I could dash past them without being seen. My plan worked and I was soon past the dreaded maze! But now which way to go? I decided to go through South Wind Grassland, the quickest route to Paris. This way was much nicer, with lots of lovely flowers and beautiful scenery! The Grassland had some very cute monsters, Fierce Treedrops! As soon as I saw them I knew they would be my favourite HKO creatures! I wish so much I could get a petcard! But, not to be distracted, I continued on my way. And all of a sudden… I was there! Paris! So it looks like I won’t have to miss out on the event after all! I will be telling you all about it tomorrow! 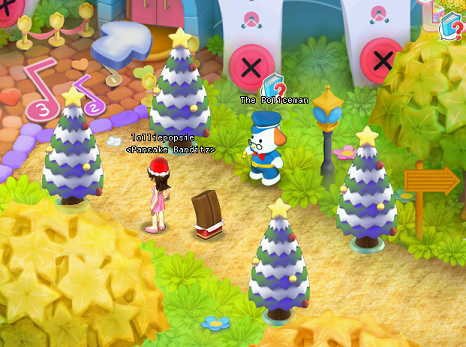 The strangest (but nicest) thing has just happened in Hello Kitty Online! 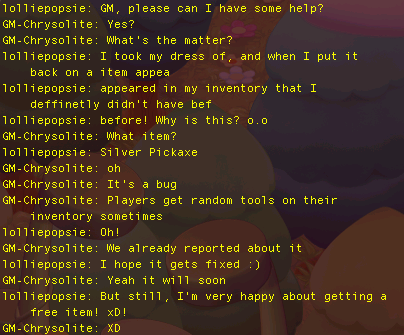 A very kind player randomly came up to me and gave me a lovely item! How strange! But it was really nice of those players to do that and they have both been added to my friends list. That just shows where random acts of kindness can get you! I always love GM Events! This morning I tried my best to wake up early so I could join in the fun. All participants met up in Paris, where the event was to be held. There were lots of people there! This event was going to be Copy Cat. That is what we played last time as well! But this time there was to be fifteen rounds, with five emotes per round. I don’t like this game, but I still had lots of fun! Unfortunately once again I didn’t win anything… I think I should really learn how to touchtype! 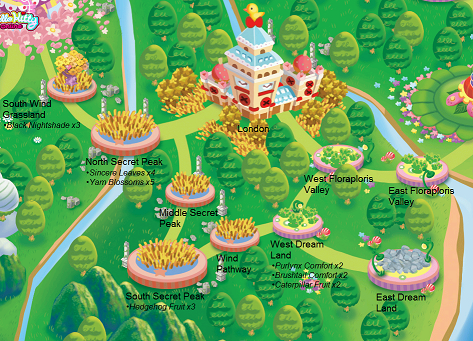 Firstly, I had to grow on my farm, but that was a slight problem as my farm is completely overrun with weeds! So we start work, digging and planting. Chocabloc is tired already! I am too tired already, so I will have to continue tommorrow… Wish me luck! This morning I was busy doing lots more Christmas questing! I had to go to London! I had never been to London before, and I was very excited! It was actually much easier to get to than I originally thought. I got there in a few minutes no problem, without restarting at all. It was really pretty there. The entrance was a lovely path, lined with Christmas trees! But it was also really big! Soon I had completed my quest and was ready to go back to the Harbour. On my way back I stopped to take a few pictures, but I hadn’t realised that a monster was attacking me! I ended up going all the way back to the beggining. That’s what happens when you don’t concentrate! 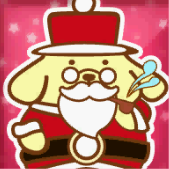 Soon I was back with Santa, and he rewarded me with lots of Dream Fragments! 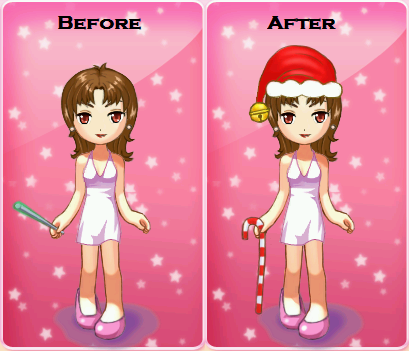 I bought some lovely Christmas gear to add to my outfit! The Candy Cane is my favourite. Today I went to Sanrio New York for the very first time! 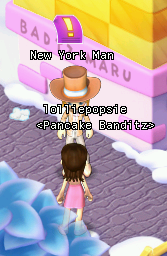 After buying my invitation (from Santa, of course) I had no idea what to do, so once again I turned to my fellow Pancake Banditz for help. I would be completely lost without those guys! As I stepped for the first time into NY I was completely taken aback. It was beautiful! But who is this mysterious man I wonder? He was there to warn me of the dangers in New York City. And then you’ll never believe who I found… Santa! He gave me my first quest to do, find the rotten mistletoe. But we soon completed the quest and were ready to go back to Santa and claim our reward! I wanted to give her a special item to say thank you, but I had nothing on me! So next time I see her I will try and surprise her with a little something! Today I participated in my first GM event in such a long time! I really enjoyed myself and will be trying to go to as many events as possible from now on! 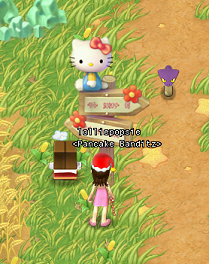 I logged onto Hello Kitty Online ten minutes before the event started so I would be nice and early. 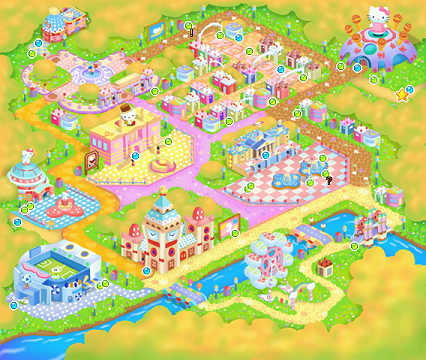 But when I looked in the Sanrio Harbour, it was nearly deserted with no GM’s to be seen! The GM in charge of the event kindly teleported me to where it was being held, in Paris! I had never been to Paris before! And soon the event was about to begin! Everyone got themselves prepared and ready to start. The GM would show us three emotes, and we had to right down as quickly as possible which ones they were. Whoever said them first would win that round! 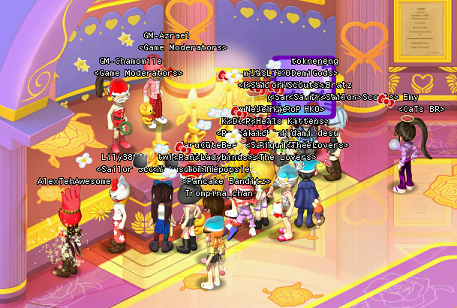 It was really nice to go back to the world of Hello Kitty Online, after so long! And now I am going to be posting all about my adventures! At first, I was a little lost. I could hardly remember anything about the last time I had been on HKO. 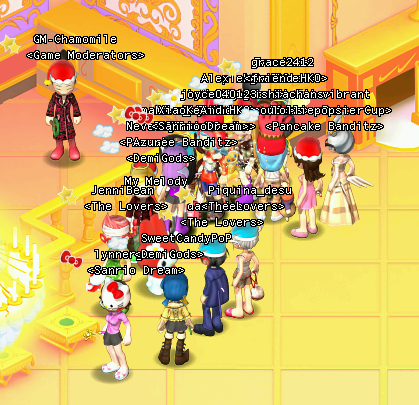 But then, I realised that there was a Christmas Event on, which of course I was very excited about joining! I wanted to buy the item needed to participate in this event right away, but I couldn’t because my inventory was full. So, off I went to my farm to empty it out a little. But when I was about to enter my farm I saw that someone needed a little help with building their house, and of course I decided to help them… I just can’t resist helping a fellow HKO member in trouble! It was actually really fun and I made some lovely new friends too! Unfortunately I couldn’t stay to see it’s completion, I had an event to go to! But, as I was about to leave, I found a new item in my inventory which I’m sure wasn’t there before! I was very curious about this, so I decided to find a GM and ask about it. Aha, so it’s a bug? I do hope it gets fixed, but I am still very happy about getting an item for free!